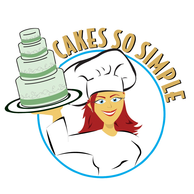 Cakes So Simple is giving tips and tricks to designing your wedding cake in Melbourne, Palm Bay, Viera, Indiatlantic and all of Brevard County. Do you know the two most photographed things in any wedding? Number one of course is the Bride. You would think that the number two spot would go to the groom, but NO!!!! The number two spot goes to the wedding cake. Yet, the wedding cake is most likely the last thing purchased when all the money has been spent. Most people have photographed your wedding cake before you ever get to your reception. That is where Cakes So Simple comes in. We can certainly give you that WOW look without killing your pocket book. Here is a tip…ssshhh don’t tell anyone…pick something that you like from three different cakes and incorporate them all into one cake. This will give your cake a very distinct one of a kind look. Give some credit to the cake designer you choose..(Cakes So Simple) We have lots of experience and can direct you on what helps a cake flow and look fantastic and what really doesn’t work well together. Here is a far out example: You have chosen teal, black and white daisies on a rectangular wedding cake. Everything else in your wedding is based off of peacock feathers. The flowers you have for your center pieces are roses and carnations. Everything is decorated with a peacock feather. And then there is your cake…lonely in the corner with daisies. There isn’t another daisy any where in site. This is epic fail. You should freely discuss your center pieces and flowers with your cake designer (Cakes So Simple). Having a cake made with daisies and not having dasies anywhere else in the wedding is definitely a no flow. Ok Back to the point. There isn’t a person alive who hasn’t designed something from inspiration. So use the inspiration from others to make your wedding cake unique. Now we go to budget…you want a huge cake but do not have a huge budget. No worries Cakes So Simple is there for you! There are so many things that we can do to give you that wow factor and stay within your budget. How do you like this five tiered cake like the one pictured below. 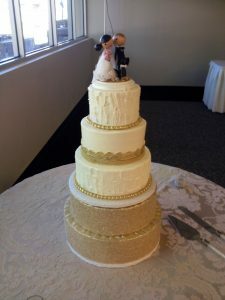 Through Cakes So Simple tips and tricks to Designing Your Wedding Cake we can make this large cake happen for you with the help of some artfully decorated styrofoam. It will be easy on your budget. Wedding cakes start at $3.50 per serving but a sheet cake is approximately $1.oo perserving. So you get the 3 tiered cake add some decorated stands and some sheet cake and bud a bing you have the large cake, servings for everyone and your guest only know that they have a fabulous tasting cake.